In 1890 Perry painted three plein-air compositions, including “Open Air Concert,” at the home of friends with whom the Perrys resided for the summer in Milton, Massachusetts near Boston. The previous year Perry had admired Monet’s paintings at Georges Petit’s Gallery in Paris and had spent the summer at Giverny, where she befriended the master and began adapting his style. Perry frequently used her three daughters as models: Margaret (born 1876) shown here playing the violin, Alice (born 1884) between her two older sisters, and Edith (born 1880) looking out at the viewer. 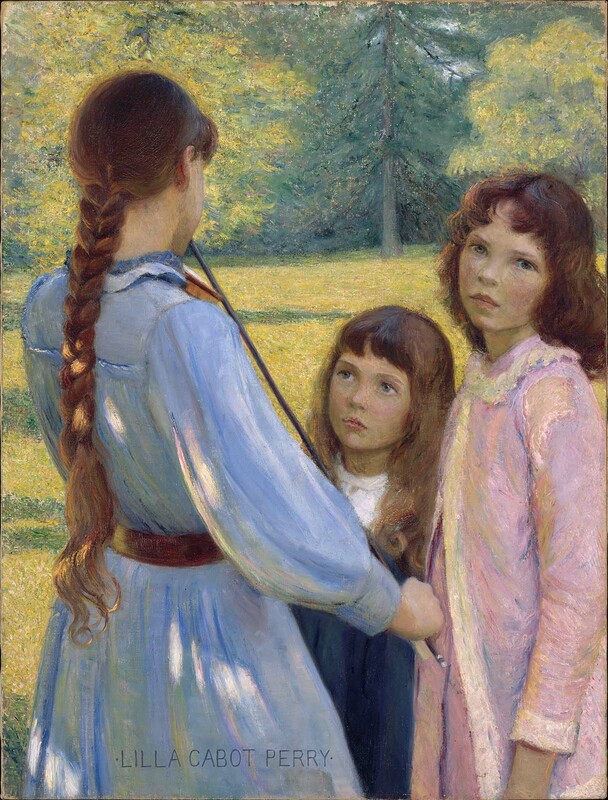 Combining her academic training with Impressionism, Perry modeled the figures solidly but dissolved the forms of the landscape behind the girls and suggested the dappled sunlight on Margaret’s blue dress with broad strokes of white and pink pigment. The acceptance of “Open Air Concert” by the juries at prestigious exhibitions testifies to their recognition of Perry’s artistic accomplishment. This text was adapted from an entry by Janet Comey in Erica Hirshler, “Impressionism Abroad: Boston and French Painting,” exhibition catalogue, Royal Academy of Arts, 2005.